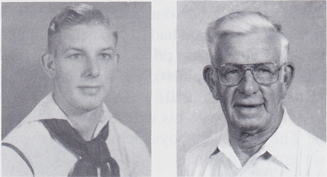 James Wesley Bellows, GMI, born March 1, 1922, Polo, IL, joined the USN Sept. 10, 1940. Military stations were Great Lakes, USS West Virginia and the USS New Orleans. He was discharged Feb. 6, 1950, with the rank of GMI. Awards include the Asiatic-Pacific w/14 stars, China Service, Philippine Liberation, WWII Victory Medal, American Defense Medal and the Pearl Harbor Commendation Medal. He has four children and two grandchildren. He lives in Apache Junction, AZ, and worked as a tool and die maker for 35 years. Hobbies include fishing, football, bowling and basketball.